When the Karzan dam was built in 1979, 19 villages, including ours, were submerged. We were paid compensation. In my student days back in the early 1980s, I was with the Congress. But when I needed a Scheduled Tribe certificate at a short notice, the Congress MLA refused to help me. A BJP MLA helped instead. Through him I came in contact with the BJP and the Vishwa Hindu Parishad (VHP). Displacement is a big issue in the Narmada district of Gujarat. I worked along with the Narmada Bachao Andolan and Medha Patkar on displacement issues, arguing that if our land was lost, then all would be lost. But I felt that they were waging an ideological battle. I was more concerned about what happens to the people. So I parted ways with them. I want good education. I want tribal areas to be as developed as the cities. I'd like to see better irrigation facilities. The forest survives because of tribal culture. Tribals know the value of natural resources. In return, the forest sustains the people. What is a tribe without mahua, bamboo? My main priority is to improve education and to bring it at par with that in the cities. I want tribal children to be as swift on computers as children in the city are. I have had some success, but not enough. When I was the tribal affairs minister of Gujarat, I worked to get the Tribal-Sub Plan implemented properly. How are these plans different from existing government plans? What are the major obstacles that you expect to face in pursuance of this vision? The welfare schemes fail because of lack of education. I want my society to be educated. The existing laws are good enough. They need to be implemented properly. Well, I would like to prevent the cutting down of forests. 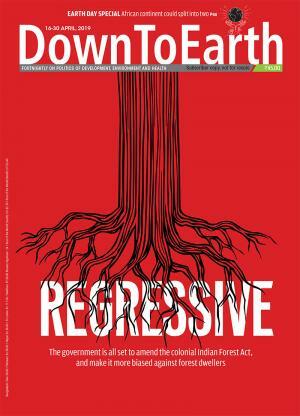 But why should the forest department own land when there is no forest on it? It surely can't grow a forest again. I am all for decentralisation. But I have noticed that not all panchayats are interested in sound forest management or managing the market of minor forest produce. Forest corporations were better at it than them. Sometimes, panchayats don't stop smugglers as some members have a stake in the illegal trade. Panchayats suffer because people are not afraid of violating the law -- they are confident due to their control of local politics. How does your vision of tribal development incorporate lessons from the past? The planning for the TSP should happen at the tehsil or district level. We have implemented this. Officials sitting in the state capital know nothing about tribal areas. And there are a lot of corrupt officials and leaders. Why is the visibility of tribal leaders so low in India as compared to the dalit leadership? For one, the dalit leadership is better organised as cities have significant dalit populations. Tribals, on the other hand, live in and around forests and are not well linked by the communications infrastructure. Besides, dalits have faced far more oppression and exploitation, which has brought their leaders out. But this is changing. Already, the tribals of Gujarat have shown how actively nationalist they are after the Godhra massacre. Have you made public your income and assets?